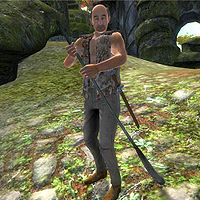 Bruscus Dannus is an Imperial commoner living in the settlement of Highcross. He has an obsession with cleaning, and spends most of his time outside the houses in the village, sweeping the road. He wears a pair of brown trousers, a huntsman's vest and a pair of huntsman moccasins. He carries an iron shortsword at his hip, his key, a broom, rake and moderate sum of gold. Bruscus' obsession with tidiness dominates his day-to-day life. He eats his only meal of the day from midnight to 2am, and sleeps from 2am to 6am. The rest of his schedule is completely random. Each day he will select a random type of item (weapons, books, ingredients, etc. ), and, providing that he's not in his house, he will pick up any which he might find, as long as it's not considered stealing. Once his encumbrance reaches 30, he will return to his house and dump the items in an armory chest on the ground floor, unless they're ingredients, in which case he will place them in a respawning food cupboard. At random times of day, Bruscus will choose one of four patches of paving outside and begin to sweep it. While Taxonomy of Obsession is running, Bruscus will often (91% chance) seek out and speak to Mirili Ulven or Runs-in-Circles if they're not in their respective houses. In his spare time, Bruscus relaxes in his perfectly ordered house. Similar to another resident of the Isles, if any of the items in his house are out-of-place, Bruscus will go crazy and begin to run around his house. This will continue until the cell resets, grinding his daily routine to a halt (although only if the player remains in the house with him). When you arrive in Highcross, you will most likely find Bruscus sweeping the pavement, occasionally trying to convince the other citizens to take a bath or clean their houses. If he notices you, he may remark: "Excuse me. I need to sweep right where you're standing." or "Would you mind stepping to the side so I can sweep there?" When you talk to him, he will ask you: "Do you ever bathe?" When asked about Mirili's research, he will explain: "She is obsessed with collecting plants and animals. I'd steer clear of her. Now, do you mind moving? I need to sweep there." and finish the conversation with: "Excuse me. I see something I need to clean." When he panics inside his house, he will repeat over and over: "Things are always such a mess around here!" Lastly, if you get near him after the Main Quest he will say: "Excuse me, my lord. I need to clean right where you're standing." If you greet him as Sheogorath, he will only comment: "Lord Sheogorath. I'll bet your palace is always neat and tidy." He may finish conversation with: "You honor me with your presence." Additionally, Bruscus will randomly engage in dialogue with both Mirili and Runs-In-Circles; four different conversations can be heard, at random times, and only if Bruscus decides to take a break from all his other activities. Bruscus Dannus: "I tried to tidy up for Mirili, but she just shooed me away. Then she had the nerve to ask for my help fetching things for her research." Runs-In-Circles: "Really? She wanted help? I could use some help. Actually I could use some food. Do you have any? I'm not picky. Anything at all." Bruscus Dannus: "No. You'd just spill on yourself anyway. Well, I have to go sweep my house. It's been over an hour. Goodbye." Bruscus Dannus: "Can I tidy up for you? Your house is always such a mess." Mirili Ulven: "Don't you dare touch anything in my house! You'll ruin my research. Hmmm. Would you be willing to run an errand for me? I'll pay you." Bruscus Dannus: "I couldn't possibly leave my house. It gets so dirty so quickly. In fact, I have to go wipe down the walls again. It's been over an hour." Runs-In-Circles: "Do you have any shoes? No? Mirili offered me some shoes if I ran an errand for her research. I just ran instead. Say, do you have any shoes?" Bruscus Dannus: "No, no shoes. But how about a bath? You really should take a bath. You shouldn't run any errands for Mirili until you take a bath." Runs-In-Circles: "Ow! These holes in my shoes are killing me. Well, gotta run!" Mirili Ulven: "Would you be willing to collect some Flame Stalk for me?" Bruscus Dannus: "Will you let me clean and organize your house?" Mirili Ulven: "No! I've warned you before to keep your brooms out of my house! Just go away. I'll find someone else to help me." In the entryway sits a cupboard that contains food along with a non-respawning chest that can hold gold and/or jewelry. Three of the six barrels contain clutter, and two of the open-top barrels holds three brooms that trigger Bruscus' panic. In the sitting area in the southeast end of the room, a table holds seven flame stalks, three void essence samples, and two bottles of cheap wine. Two clutter barrels sit nearby, as well as three clutter crates. Under the stairs four wine racks, stacked two high, hold a total of thirty-two more bottles of cheap wine. An open-top barrel holds another broom, and two more lie on the floor nearby. Moving or taking these brooms or the flame stalk samples on the table also cause him distress. The alcove on the northwest wall holds a food cupboard as well as a non-respawning chest that normally holds random armor and/or weapons. Bruscus uses this chest to store the weapons, armor, books, and miscellaneous items he collects. The two shelves on the wall hold two non-respawning covered bowls that contain food as well as several dishes; all of the items on these shelves except the three tan jugs on the shelves on the right will also trigger Bruscus' anxiety-driven frenzy. On the northeast wall sits the food cupboard where Bruscus stores the ingredients he collects; since this container respawns, ingredients will not be stored here indefinitely. The table beside it holds a bottle of mead and a stone mug as well as a cheese wedge on a tan plate. The dishes here, if disturbed, also give Bruscus alarm. On the top floor, the first room is a storage room that holds four clutter barrels, a clutter crate, a chest of drawers that also contains clutter, and a single non-respawning chest that holds armor and/or weapons. The second room is Bruscus' bedroom. A chest of drawers next to the door holds clutter and on top sits a huntsman vest, an hourglass, and two stone mugs. On the floor between the chest of drawers and the bed lies a belted vest, a pair of rough leather shoes, and a pair of stitched leather shoes. A clutter chest sits at the foot of the bed. The shelves at the end of the room hold three tan pitchers, with another on the floor beside it. These pitchers and the dishes and hourglass on the chest of drawers are the last items in the house that can trigger Bruscus' panic. I hear the newcomer made a real mess in Passwall. I sure hope he stays out of Highcross. With the Gatekeeper gone, it's only a matter of time before we have every manner of riff-raff swarming into the Isles. I'm glad that the Resonator is working again. Enough riff-raff around this place already. Duke Thadon's got his happy juice back, I hear. Good for him. He's always kept things very orderly. I like him. The Paranoid Duchess is at it again, from what I hear. If you ask me, we could do for a little more law and order around here, too. The Great Torch has been relit. I wonder if that's a good sign, or a bad sign? A new ruler in Crucible? It doesn't concern me. A new ruler in Bliss? It doesn't concern me. I'm not saying I like the idea of these Knights and all, but the Shivering Isles could really use a dose of Order. Have you seen the new Gatekeeper? I hear they built him with four arms and no head! Or was it four heads and no arms? The new Duke is really taking charge of things. Maybe there is hope for the Realm. We're doomed. The Greymarch can't be stopped. We'll all be Ordered like the old tales tell. It's... unbelievable. Order was defeated? All the old tales say that's impossible. Bruscus will not dump clothing into his special chest. This is to prevent him removing his own clothes, but it also means that he will never get rid of any excess clothing he might pick up. This page was last modified on 20 October 2015, at 06:29.